The Royal Dutch Mint have released the 2014 dated circulation coin set in brilliant uncirculated (BU) quality for collectors which includes the new definitive portrait of HM King Willem-Alexander on the two highest denomination coins. The 5 Gulden, 2 ½ Gulden and 1 Guilder coins bear the likeness of the king who faces to the right in contrast to the previous coins which saw his predecessor and Mother, Queen Beatrix, facing to the left – as is custom for reigning Dutch monarchs to alternate facing directions when they succeed to the throne. 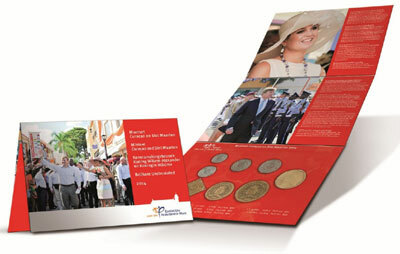 The new set includes eight denominations to the one cent with the presentation folder featuring images of the Royal couple’s visit to the Dutch Antilles earlier in 2014. The obverse and reverse sides for the 25 cent to the one cent coins remain unchanged and the square-shaped 50 cent coin also remains unchanged on both sides. The coins are intended for circulation in both Curacao and Saint Maarten. The new portrait is the work of artist Juan Sanchez – Castano who is a designer at The Royal Dutch Mint. For more information on this and other coins and sets from Curacao and Saint Maarten which make up the Netherlands Antilles issuing authority, please visit the website of the Royal Dutch Mint at: http://www.knm.nl/BU-set-Curaao-en-Sint-Maarten-2014/nl/product/4122/ Information offered in Dutch, European destination orders dispatched. I think so too! – the comments used to be about Netherlands Antilles vs. Dutch coinage was that the Antillean portrait was much more preferred than the more modern or stylised portrait used on circulation Dutch coinage.